"MAPMAKING CROW" and "THE OWL’S PALETTE"
“Mapmaking Crow” and “The Owl’s Palette” were next in my series of painting exploring birds and other living creatures. They were inspired by an experience I had this last spring, at my home studio, which happens to be set in a beautiful suburban forest. While painting, I was summoned outside by the hoo-hoo-hooting of the Barred Owl calling for a mate. There she was, resting in our cedar grove, like some kind of ancient alien being. Face-to-face, we stood and stared, locking eyes with one another. With a hushed gaze, I admired this wondrous creature and felt a calming groundedness envelope me. However, it was not too long before a crow and her black feather friends also became alerted to this Barred Owl’s presence. I later learned that the owl and crow are archenemies, and the crow’s cawing made it quite clear that owl was far too close for comfort within this crow’s home territory. I feel grateful for the treasures in the midst of my day-to-day experience, which graciously call my attention to the beauty and sympathy of all things. I see these paintings as a kind of call and response with Nature, much like a bird’s call to mate, or a singer’s harmony with the voice of a choir. 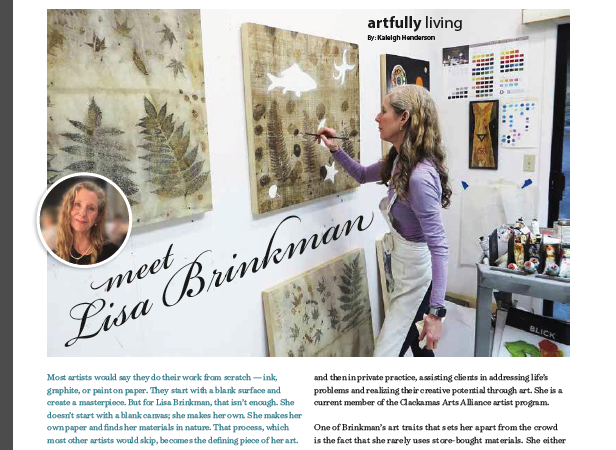 The paintings represent my relationship and conversation with the natural world. 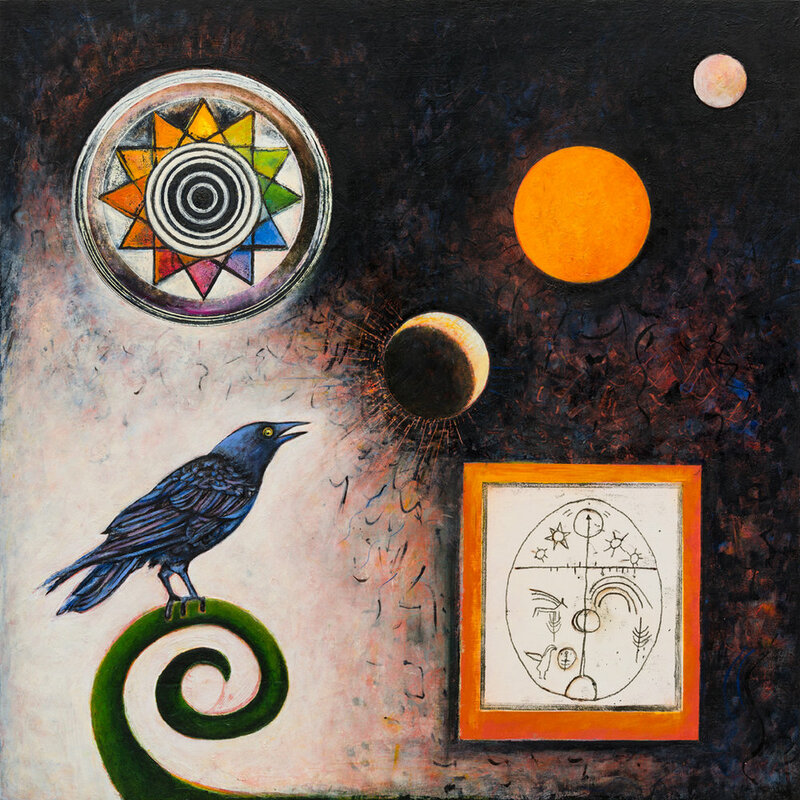 The painting, “Mapmaking Crow” contemplates our fundamental personal search for meaning within metaphors of territory, mapmaking, astrology and cosmology. The composition has a relationship between light and dark, much like a yin/yang symbol holds the severe contrast of black and white in unity. The painting depicts a silhouetted crow on a fern-green spiral, seemingly contemplating the universe, where an egg-like map is framed and diagonal to a twelve-petal astrological mandala. “The Owl’s Palette” renders a Great Horned Owl majestically sitting on a tree stump. A full harvest moon shape haloes her while she engages the viewer in eye-to-eye contact. 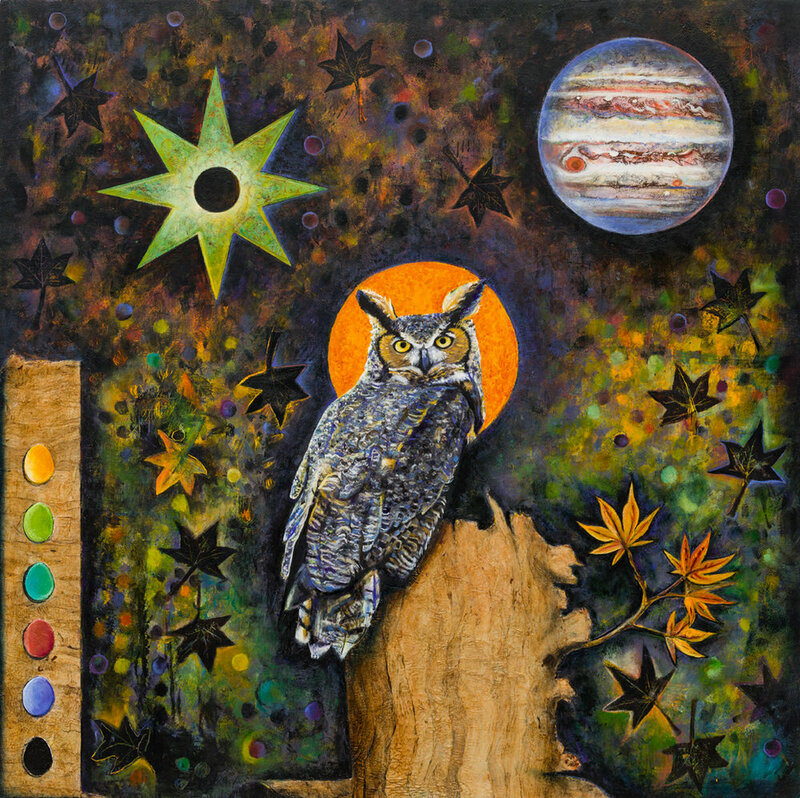 An autumnal Japanese maple leaf pattern is repeated throughout, with the Owl nestled between the planets, Jupiter and Venus, and an artist’s palette of egg-shaped colors.